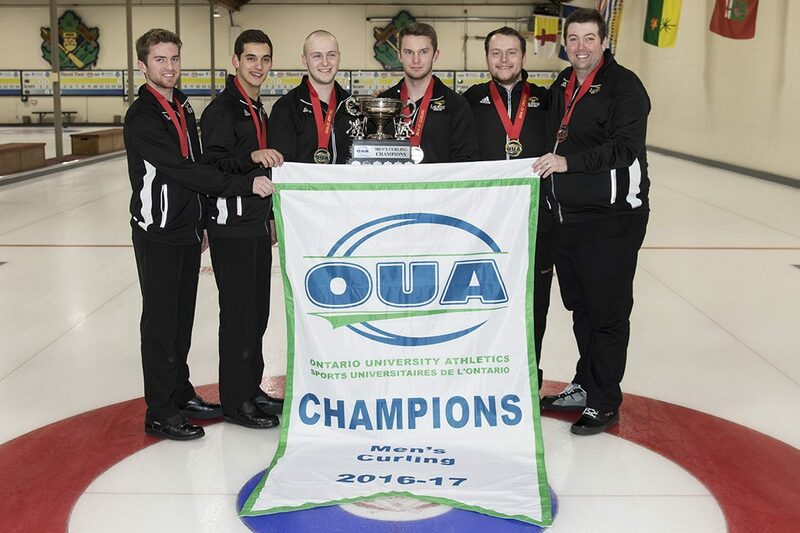 The Wilfrid Laurier men’s curling team captured the gold medal for the third straight year at the Ontario University Athletics curling championship last weekend. The rink, consisting of skip Matthew Hall, vice Jordie-Lyon Hatcher, second Kenneth Malcolmson, lead Russell Cuddie and alternate Jeffrey Wanless, went undefeated in pool play and in the playoffs to finish the championship 10-0. The win secured a berth into the U Sports curling championships, set for mid March in Thunder Bay, Ontario. With a fresh lineup, the men’s rink went a perfect 7-0 in the first four days of competition, earning first-place in their pool. Wilkinson said that the team hit some speed bumps along the way on the second day against Western and Queen’s, where the men stole a point in the eighth end of both games to remain undefeated. “We knew the depth Queen’s had and we knew that was going to be a big game,” coach Wilkinson continued. That momentum carried through the rest of the championship into the final game, where the men faced off against Queen’s in the gold medal game. Taking an early 2-0 lead in the first end, the Hawks blanked the next three ends to keep momentum coming into the second half. After Queen’s tied things up, the Hawks responded with another deuce to take a 4-2 lead in the sixth end. Limiting the Gaels to only a single point, Hall made a draw into the four-foot while facing three stones to seal the victory for Laurier. Wilkinson said that the boys played really well in the final, especially in the first half of the game. “[There was] a couple of road stumbles in the fifth end, but other than that, had to hit the four-foot for the win and the boys curled to the button for Matt. So Matt threw it well and the boys judged it well,” he said. The women’s rink, consisting of skip Chelsea Brandwood, vice Brenda Holloway, second Riley Sandham and lead Kirsten Marshall, finished pool play with an overall record of 5-3 before going into the playoffs. Coming into the final end without hammer, the Hawks were unable to hold the Varsity Blues off the board. Toronto scored two, taking a 7-6 lead, ending Laurier’s shot at four straight titles. Wilkinson said that the women went through the same building blocks as the men did, but for some, things didn’t go their way in the quarterfinal match. “Not the result we were looking for, but the girls hung in there, battled the whole week, but just some unfortunate moments in the quarterfinal,” Wilkinson said. And with the national championships under a month away and with the men returning from Reading Week, the focus shifts immediately onto the task at hand: pointing out things they liked, didn’t like and what they can do better going forward at this years edition of the U Sports Championship. And of course, lots of practice. The U Sports curling championship begins on Saturday, March 18 at Fort William Curling Club in Thunder Bay.